A leaky heart valve might go unnoticed. Or it could cause health problems that could be either minor or serious. How serious a leaky heart valve is depends on how much it interferes with normal blood flow through the heart. Treatments include medicines, surgical repair, or surgical replacement of the leaky valve. Observation over time for changes is the most common approach to a leaky heart valve. The valves consist of flaps that open to let blood flow in one direction as it moves through the chambers of the heart. Then the valves close to keep blood from flowing backwards into the chamber it just left. 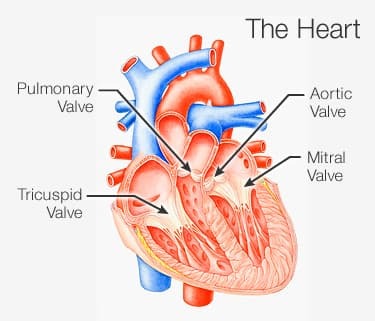 Each valve typically has three flaps, except for the mitral valve, which has two. Any of the four valves can become leaky. This means that just after the heart squeezes and pumps blood forward, some blood will leak backward through the valve. Leaking through the valve is also called valve regurgitation. A person’s description of symptoms along with the physical exam and echocardiogram can determine how serious a leaky heart valve is. Frequently, a leaky heart valve causes no symptoms. Many healthy people have one or more valves that are slightly leaky. Even when there is significant valve regurgitation, there may be no symptoms. Many people with aortic regurgitation only require observation over time. People with symptoms due to severe aortic valve regurgitation may benefit from certain blood pressure medicines called vasodilators. Other drug treatments for congestive heart failure, such as diuretics, can be helpful in severe aortic regurgitation. When aortic regurgitation is severe, surgery is sometimes the recommended treatment. A surgeon will usually replace or repair the leaking aortic valve. Some people with a leaky mitral valve don't require treatment. The standard approach is observation over time. Experts don't recommend daily medication for mitral regurgitation unless there is significant heart failure. Surgery to repair or replace a mitral valve that is leaking severely can result in significant improvement for certain people. Because mitral regurgitation is slowly progressive, deciding when to operate -- neither too early, nor too late -- can be difficult. Many healthy adults have a slightly leaky tricuspid valve. This may be discovered incidentally, usually causes no problems, and does not require treatment or follow-up. Moderate or severe tricuspid regurgitation may result from pulmonary hypertension. Pulmonary hypertension is high blood pressure in the pulmonary artery. This high blood pressure has many possible causes. The main one is congestive heart failure. Medicines may not be effective in treating tricuspid regurgitation. Diuretics, or water pills, can help relieve body swelling, or edema, that’s due to congestive heart failure. The swelling is not always present, however. The tricuspid valve may be repaired during surgery to correct other leaky heart valves. Surgical repair of the tricuspid valve generally works better than replacing it. Surgery to replace the tricuspid valve by itself (not along with the mitral or aortic valve) is only recommended in rare cases. Usually, no treatment is required for pulmonary regurgitation. Treating the underlying medical condition is the best approach. Everyone with a leaky heart valve can benefit from daily exercise, like walking. Before engaging in competitive or contact sports, people with severe valve regurgitation should talk with their doctors. Not smoking and maintaining a healthy weight are just as important for people with leaky heart valves as for other people. Regular follow-up with a doctor, even when there are no symptoms, can ensure a leaky heart valve does not cause problems that could be avoided. Borgeson, D. Journal of the American Society of Echocardiography, 1996; vol 9: pp 832-837. Enriquez-Sarano, M. New England Journal of Medicine, 2004; vol 351: pp 1539-1546. Otto, C. New England Journal of Medicine, 2001; vol 345: pp 740-746. Bonow, R. Circulation, 2008; vol 118: pp e523-661. Guenther, T. European Journal of Cardio-thoracic Surgery, 2008; vol 34: pp 402-409. Lee, J. Circulation Journal, 2010; vol 74: pp 375-380. Libby, P. Braunwald’s Heart Disease: A Textbook of Cardiovascular Medicine, 8th edition, Saunders Elsevier, 2007.